I wrote two pieces arguing for a typology of property rights. Short story shorter. Because property is a relation among men with respect to an object, we can classify property according to the relationship the property owner has with other people. The other people can be family/friends, anonymous strangers, and government. Property can also be distinguished by contracts and personal property which has the threat of violence and theft. These distinctions result in this chart. Below is a quote from Further typologies of property rights. The second part is more interesting, how to enforce contracts among anonymous strangers, 3 in the table, and how to ensure there is no violence and theft against anonymous strangers 4. Most economists are unclear on the distinction between the two options, however it is an important one. There is much evidence, international trade being the primary one, that state enforcement is unnecessary to protect contracts among anonymous strangers. However, as Gurri pointed out, the state is likely necessary to protect against violent expropriation from anonymous strangers. As such, the state exists less to protect private property per se, and more to protect against a specific type of encroachment on private property. In fact, given that many major American cities did not have police departments until the mid 19th century, it seems state exist primary to prevent large scale violence. I would like to use this framework to critique academic anarchists. They tend to focus on 3 in the table, whether the state is necessary to enforce contracts among anonymous strangers. Some academic anarchists also investigate whether stable rules can emerge in chaotic situations. However, both research agendas miss the hard question 4, whether a non-monopoly of force can prevent theft and violence by anonymous strangers in a modern city like environment or larger. To the extent anarchism is a normative project, whether it is a desirable alternative to modern first world governments is an important question. This requires a mechanism to protect against anonymous third party theft and violence. David Friedman provided the theoretical mechanism, as well as an important case study. Unfortunately, there has been little focus on this question since. Nor over the last century have the various substitutes for Christianity managed to fill the void. Political religions like communism and fascism failed bloodily, leaving behind mountains of corpses. Nor has secular social democracy, with its utopian ideals, provided people with a transcendent principle that justifies sacrifice for the greater good, or even gives people a reason to reproduce. A shared commitment to leisure, a short workweek, and a generous social safety net is nothing worth killing or dying for. Neither is the vague idea of a transnational E.U. ruled by unaccountable Eurocrats in Brussels and Strasbourg. More important, from its beginning, the idea of the E.U. depended on the denigration of patriotism and national pride, for these were seen as the road to the exclusionary, blood-and-soil nationalism that fed Nazism and fascism. Yet all peoples are the product of a particular culture, language, mores, histories, traditions, and landscapes. The “postmodern” abstract E.U. ideal of transcending such parochial identities was destined to collide with the real cultural differences between European nations. Don’t let last month’s anticlimactic referendum fool you: Spain is fragmenting, and disappointment over what happened—and especially what didn’t—in November will only deepen the cracks. Catalans are just looking for the next vehicle for their frustration and impatience. Uyghurs do, if they play it right, have the capacity to make Xinjiang ungovernable. It’s possible a truly general uprising would result in a bloodbath that would make the Tiananmen Square massacre look like nothing. But if it happens in the context of a general unraveling of Chinese unity—with separatist sentiment on the rise in Taiwan, Hong Kong, and Tibet as well—then anything can happen. Go read his Kurdistan (#1) comments for yourself – not to be missed. 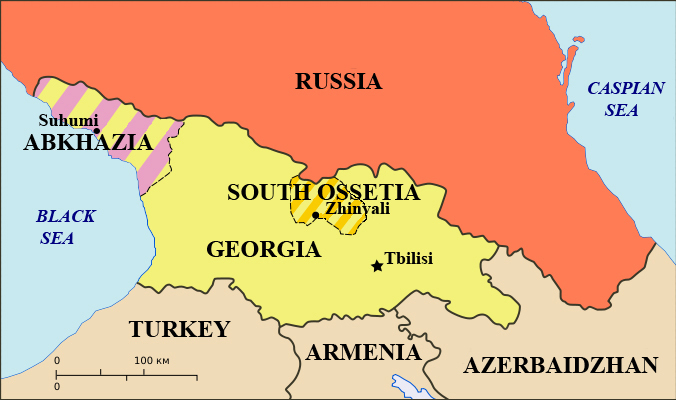 Despite its geographic size, South Ossetia only holds about 50,000 people. 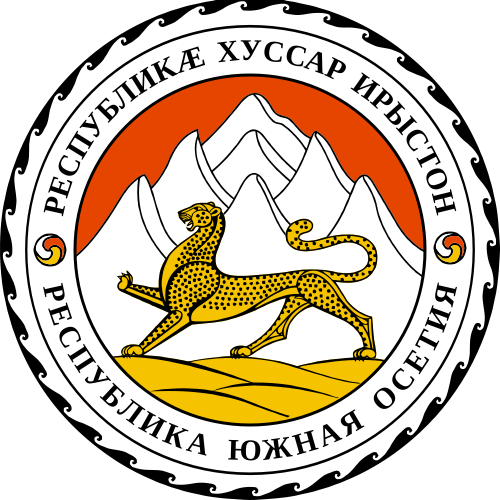 Here is the wikipedia entry and below is a map of the region as well as their coat of arms. Related: how nervous does Putin make Estonia? This ultimately renders humanitarian appeals for recognition in Kosovo and Palestine (and Abkhazia, and eastern Ukraine, and Kurdistan) rather dishonest. The nations in question, the actual people vying for self-determination, are championed by their respective supporters as suffering nobly under the yoke of amoral oppressors. To the pro-Kosovo faction, big-bad Russia and little-bad Serbia impede international recognition for the sake of being bad. To the pro-Palestine crowd, big-bad America and little-bad Israel deny Palestinian sovereignty within the same, moralistic, black-and-white framework. All parties seem to use righteous indignation to their political advantage; except, of course, the parties with the most tangible stakes: the Kosovars and Palestinians. They are minimized to little more than chess pieces—pawns, in fact, the most disposable of chess pieces—buffeted between elite players in the great game of 21st century realpolitik. A game that, for these would-be states, offers no discernible prize. A majority (52%) of Germans now want Greece out of the Eurozone. That’s 11 points higher than two weeks earlier. Is a Scottish exit inevitable? Good stats are hard to come by, but violence in Xinjiang / East Turkestan seems to be on the rise. Both Lake and Lassen Counties voted 3-2 to place the State of Jefferson on their general ballots. A dissenting Lassen county supervisor prefers to take aim at a 1964 Supreme Court Decision instead. The founding of California was an adventure, an epic, a tragicomedy, a conquest, and a window into America’s soul. It was a creation ex nihilo that reveals the roots of society, the establishment of justice, and the very nature of man. “All our brutal passions were here to have full sweep, and all our moral strength, all our courage, our patience, our docility, and our social skill were to contend with these passions,” native son Josiah Royce wrote of his motherland in 1886. Philosophers have long extrapolated from existing states, of whose origins the precise details are lost, just how political life comes into being. In California, there is no need to speculate. It happened only yesterday, every noble act and sordid deed alike recorded. Came across a recent internet poll asking if Upstate NY should secede. Comment # 8 is worth a look, highlighting the usual rural / urban policy mismatch. South Miami is looking for help splitting Florida up. 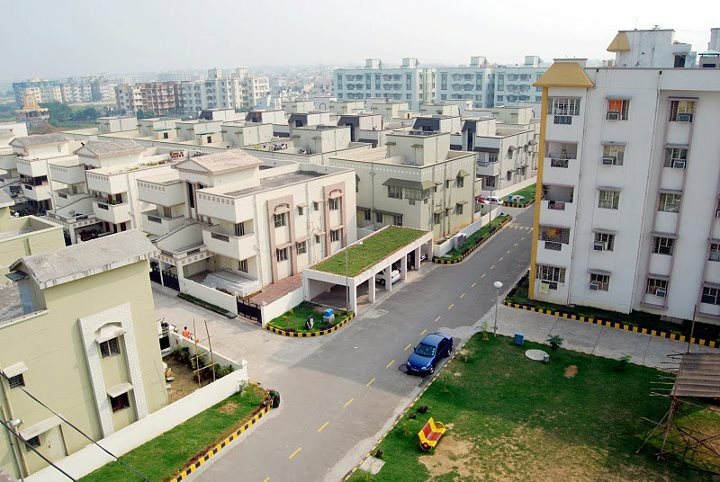 Alex Tabarrok and Shruti Rajagopalan in the NYT with an op-ed on private cities. See also his chat with Russ Roberts on this topic. The Economist is optimistic on the American Latino demographic. March 16th was Open Borders Day and an Open Borders Manifesto was written up. Here is their link round-up from the day. Small countries in need of cash are selling rights to citizenship. Programs in Bulgaria, Cyprus, and Malta will have EU-wide ramifications. Seasteading might get its own reality show. 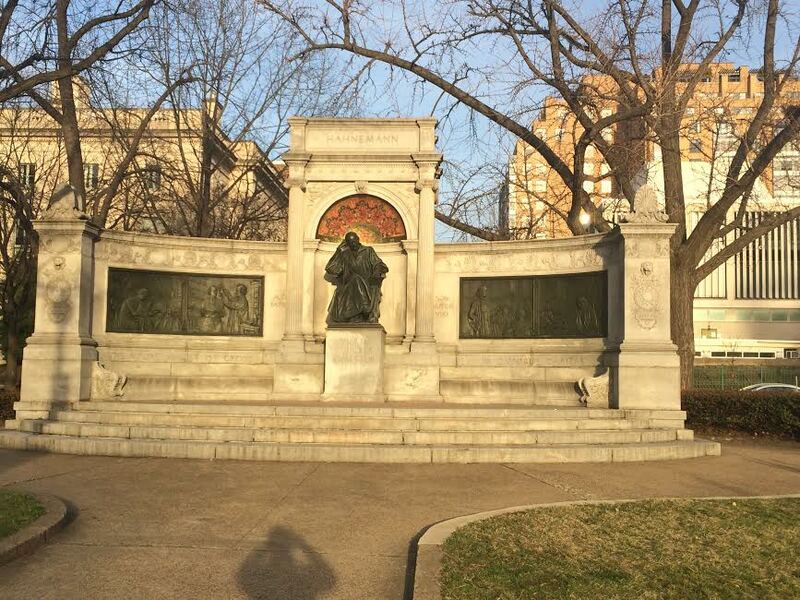 Statue of Samuel Hahnemann, inventor of homeopathy, on Rhode Island and Massachusetts Ave, DC, plus my silhouette. In actual fact too we find that the more a cultivated reason concerns itself with the aim of enjoying life and happiness, the farther does man get away from true contentment. This is why there arises in many, and that too in those who have made most trial of this use of reason, if they are only candid enough to admit it, a certain degree of misology – that is, a hatred of reason; for when they balance all the advantage they draw, I will not say from thinking out all the arts of ordinary indulgence, but even from science (which in the last resort seems to them to be also an indulgence of the mind), they discover that they have in fact only brought more trouble on their heads than they have gained in the way of happiness. On this account they come to envy, rather than to despise, the more common run of men, who are closer to the guidance of mere natural instinct, and who do not allow their reason to have much influence on their conduct. So far we must admit that the judgement of those who seek to moderate – and even to reduce below zero – the conceited glorification of such advantages as reason is supposed to provide in the way of happiness and contentment with life is in no way soured or ungrateful to the goodness which the world is governed. Kant had captured the spirit of what had nagged me plenty of times over the past handful of years. Was deeper philosophical and scientific pondering counterproductive to contentment? Is ignorance, in fact, bliss? While I very much enjoyed giving critical thought to large, fundamental questions I had only paid mental lip-service to before, the possibility of unsettling conclusions unsettled me. If my priors on the efficacy of the minimum wage or the desirability of liberal immigration turn out to be dead-wrong, I’ll get over it. On the other hand, if human consciousness is a mere illusion and the universe evolved along a deterministic, meaningless path, well, that one’s a bit tougher to swallow. Forget the challenge of defending a libertarian political worldview in a world where no one is ever responsible for any action; entertaining the thought that oneself is a robot for the first time isn’t a lot of fun. Existential crises are accurately named. Besides, who can blame you for supporting a particular viewpoint anyways, if you don’t actually choose to support it? And how can any of the criticisms that I levy, in turn, be legitimate if free will is a myth? And so on, and so forth. Or perhaps human agency does exist but occupies a much smaller role in explaining action than I initially attributed it. If intuition fills that newly created void, then the potential implications are troubling. Intuition may be somewhat malleable to the human will, but nobody gets to pick their genes (at least up until now) and Kant awards you no points for intuition, concluding that an action’s “authentic moral worth” is driven by an inviolable sense of duty and not “inclinations” or utilitarian calculations alone. Since a lot of beneficial acts, in my opinion, do not stem from a sense of duty, deeply reasoned or otherwise, “good” people suddenly look a lot less good. But it gets worse. If conformance to duty is the only source of moral worth than are people who do not act from duty yet are gifted “good” inclinations on precisely the same moral standing as those who got the short end of the stick with “bad” ones? I went down similar logical rabbit holes elsewhere but never really reached any hard conclusions on most of the “big” questions, just very weakly held beliefs. To a certain degree, I have come to accept a transition from taking metaphysical and religious priors for granted to answering “I don’t know” and “yeah, maybe” a lot more. Still, coming out the other side without clear answers didn’t feel much better than some of the anxiety on the way in. David Bazan has some pithy lyrics that come to mind from an album chronicling his fallout with religion. I can’t fully arrive at Bazan’s latter group, and that bothers me. Most of the big questions still bother me. Employing reason where intuition and untested assumptions once toiled didn’t advance my position on any axis of happiness and incremental peace from such exploration didn’t materialize in the end. While some emerge from such a journey with greater or equal conviction, blissful ignorance and blind acceptance can seem very peaceful if that conviction fades instead. This is the nagging thought that gave initial weight to the quoted excerpt above. I had suppressed it on a few occasions and reluctantly half-recognized its presence on others, yet never fully addressed it until Kant stuck it in my face. Maybe the answers are unsettling, and reason is the only way to find them, and therefore ignorance is bliss and reason torture. If you didn’t know a question existed, it’s impossible to let potential answers bother you. Reason is responsible for discovering not only the answers, but the questions as well. As for now, I don’t regret thinking some of the bigger issues through as they seem to have left me no worse off. Reason can still be a very powerful tool for good, even if that doesn’t perfectly translate to happiness and even if liberals overestimate its importance. I can’t sign on to the “ignorance is bliss” mantra in this context, but the possibility still lurks, re-surfacing every time I catch myself wondering about determinism or spooky physics and getting a bit unnerved. But perhaps my reading of Kant is much too negative, after all, the gift of reason as a means to developing a good and pure will seems in line with what a divine being might impart to agents also given free will. Should that be my reading of it? I don’t know. Add it to the list I suppose.